In 1806, the Stamford Mercury (which claims to be Britains' oldest newspaper) reported that a man from Leicester named Daniel Lambert who weighed in excess of 50 stone, was having a carriage built in order to 'exhibit himself as a natural curiosity'. The naturally reclusive man charged a (then) hefty admission fee of one shilling - the profits of which, it is presumed helped pay for his servants who assisted him and specially-made clothes. In June 1809, Lambert arrived in Stamford for the races and lodged at the Wagon and Horses Inn, where he died suddenly. Such was his size, a wall of the inn had to be completely demolished in order to remove his body. 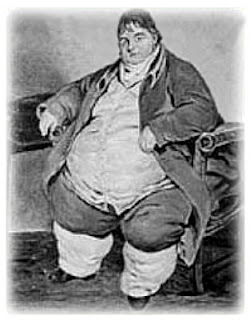 At the time of his death, Daniel Lambert weighed 739 pounds (almost 53 stone or 336 kilos) - his waist measured 9ft 4ins, his calf measurement 3ft 1in. He was buried in the church yard at St Martin's, Stamford and he maintains the dubious distinction of being one of the most obese men in history to this day. Items of his clothing are still on display in Stamford Museum.